How The Dream Of America's 'Nuclear Renaissance' Fizzled Construction of new, modern reactors seemed to herald a new era of nuclear power expansion in the U.S. Now all but one of those projects have been canceled. 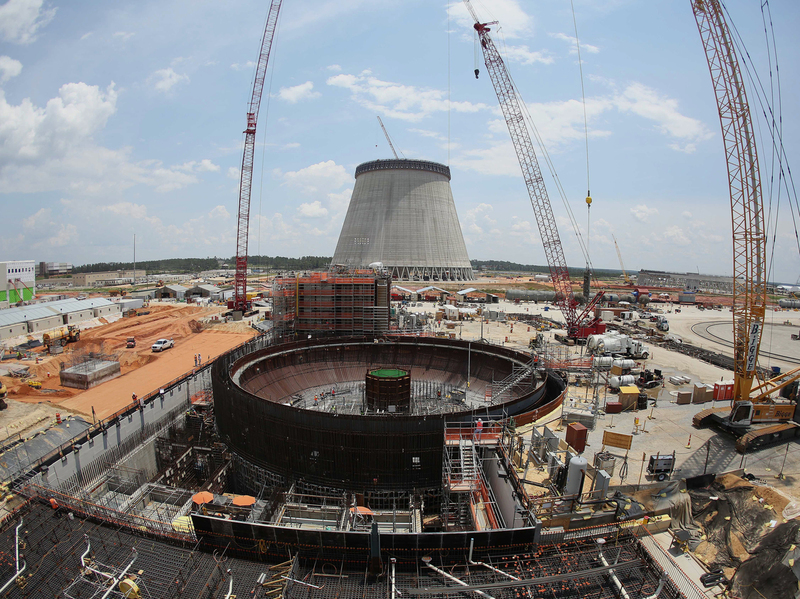 This June 13, 2014 file photo shows construction on a new nuclear reactor at Plant Vogtle power plant in Waynesboro, Ga.
A decade ago, utility executives and policymakers dreamed of a clean energy future powered by a new generation of cheap, safe nuclear reactors. Projects to expand existing nuclear plants in South Carolina and Georgia were supposed to be the start of the "nuclear renaissance." But following the decision last week by two utilities to scrap the expansion at the Virgil C. Summer Nuclear Generating Station in South Carolina, that vision is in tatters. There's now just one nuclear expansion project left in the country, its future is also uncertain. That remaining project is an expansion at the Vogtle Electric Generating Plant in eastern Georgia. As recently as five years ago, then-Energy Secretary Steven Chu visited Plant Vogtle and declared the project the start of "the resurgence of America's nuclear industry" and a critical part of President Obama's energy strategy. The two new reactors at Plant Vogtle were the first next-generation reactors in the country, and some of the first new reactors to be built in the U.S. in three decades. After the partial meltdown at Pennsylvania's Three Mile Island in 1979, the U.S. nuclear industry went into hibernation for more than two decades. But by the early 2000s, the Three Mile Island accident and the 1986 meltdown at Chernobyl were distant memories, says Paul Murphy, managing director in the energy group at the law firm Gowling WLG. "On top of that, people were projecting significant growth in power demand," he adds. The earlier generation of nuclear power stations are also starting to reach the end of their lifespans and some are being shuttered. Building a nuclear reactor is expensive and time-consuming but once it's up and running, it offers cheap and reliable electricity without generating the greenhouse gas emissions that contribute to climate change. With encouragement from the federal government, utilities around the country began applying for permission to build new reactors. At Vogtle in Georgia and V.C. Summer in South Carolina, power companies got to work. "I thought it was going to be a very good thing for the Southern economy," says Marilyn Brown, a public policy professor at Georgia Tech and board member of the Tennessee Valley Authority, which operates three older nuclear power plants in Alabama and Tennessee. Then there were setbacks. First came the global financial crisis, which flattened the demand for electricity. Then fracking flooded the market with cheap natural gas. Renewable energy — especially wind power — also got more competitive. According to Brown, "that meant if you went back to reappraise the nuclear investments, they probably would not have been approved, or might not have been approved." Both the Georgia and South Carolina nuclear projects racked up billions of dollars in cost overruns and delays. Then earlier this year, Westinghouse, which was building the reactors in both states, went bankrupt, blaming high construction costs for its problems. Finishing the plant in South Carolina without Westinghouse didn't make financial sense for the South Carolina utilities, so they scrapped the project. "Last kid on the block"
"Now Vogtle's the last kid on the block," says Stan Wise, the chairman of the Georgia Public Service Commission, which regulates local utility Georgia Power. The utility says it will propose later this month whether or not to complete the Vogtle expansion. Wise says Georgia Power is in a better financial situation than the South Carolina utilities, since it has more ratepayers to support the project. Georgia Power's customers have been paying for the new reactors in their monthly power bills since 2011. "I'm still a proponent of nuclear," says Wise. "I'm going to keep my powder dry in the coming weeks and months as we decide whether or not to continue this project." Marilyn Brown at Georgia Tech says she hopes the Plant Vogtle expansion is completed. "I'm a person very concerned with climate change," she says. "If these plants can't be continued, then where would you build the next one? Is that the demise of the industry?" But for now, Brown says the American nuclear renaissance appears to be stalled.